Yep that’s me. Or it is soon going to be. 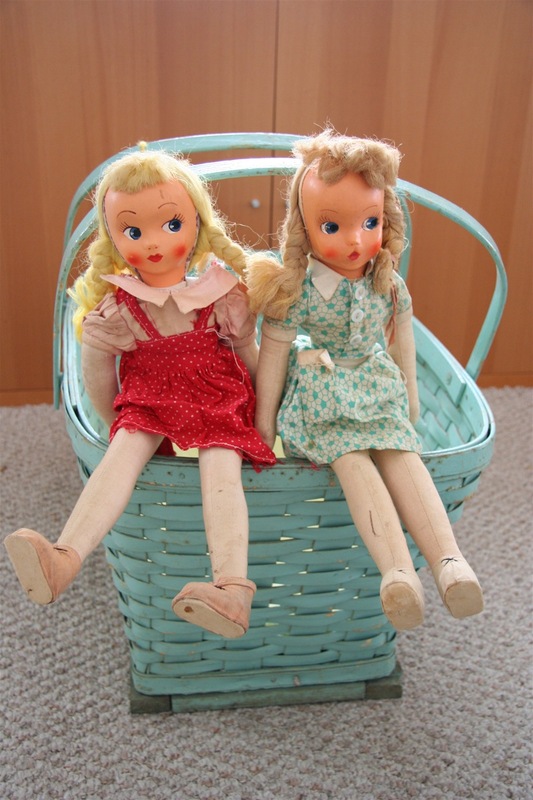 We went to this amazing crazy estate sale on Friday that was baby doll madness! I think this woman must have been the old Grandma in the neighborhood who has an open invitation for all the kids to come over to play with a stockpile of outdated toys. When we first walked into the backyard and saw the boxes and boxes and boxes of dolls I about had a heart attack. It quickly became apparent though that the majority of them were filled with very used, very played with baby dolls. Almost all of them with choppy haircuts. I was a little disappointed at first – as I’m definitely in the market to start my own stash of baby dolls for niece Maggie – but there was so so much stuff and ultimately lots great finds when we hunted through everything. We found these sisters in the basement and though pretty beat up, I think they are just the most beautiful dolls. They’re sitting on the new huge blue basket. 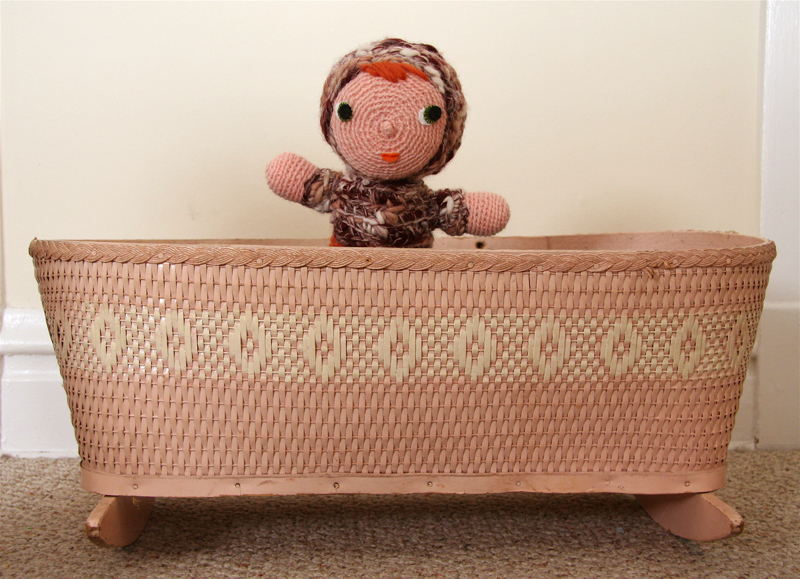 And this, such a sweet sweet find, a pink basket babydoll bassinet! at first I was, oh, let’s get it for Maggie. yeah right. it’s most definitely for me. I’ve already got my Camilla doll playing in there. I couldn’t pass up these great mod Japanese dolls. I’ve seen them all over my Japanese craft books. I’ll have to hunt down some photos. The tags say they’re Dream Dolls. I had the most fun in the cheapy bin of souvenir dolls. I’ve been thinking of this type of doll a lot since I saw this display at the Childrens Museum. I could have gone crazy but I think I showed a lot of restraint. Although I did get a few more than I have pictured here. 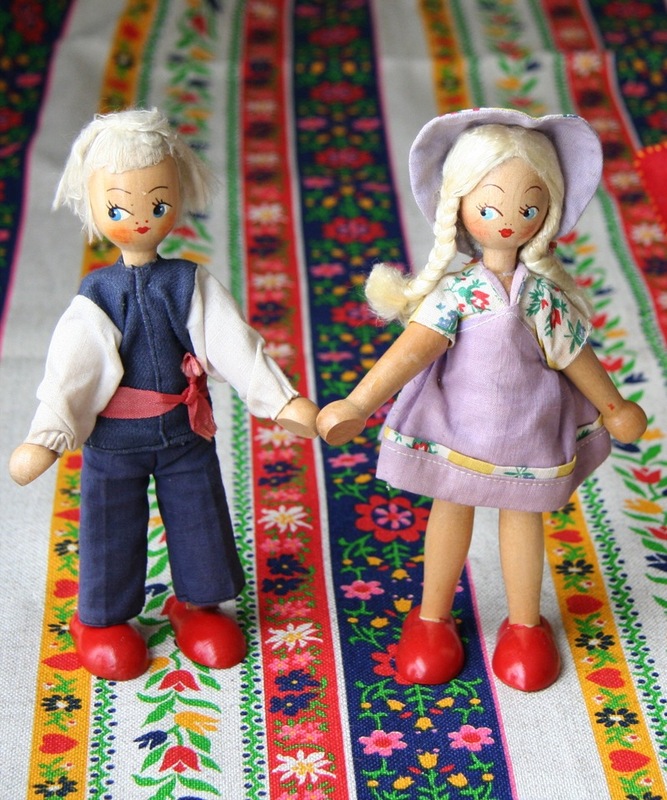 and while we’re on the doll subject, I finally found myself some Polish Joli dolls. I’ve been wanting these for so long. Now that I’ve finally started my collection maybe Mia and I can form a club. oh yay! i thought i was the only crazy doll lady! i love finding the beat up sweet ones at yard sales and thrifts – the ones you found are great! What an amazing day of finds! I am seriously jealous. We never have good yard sales like that around here! 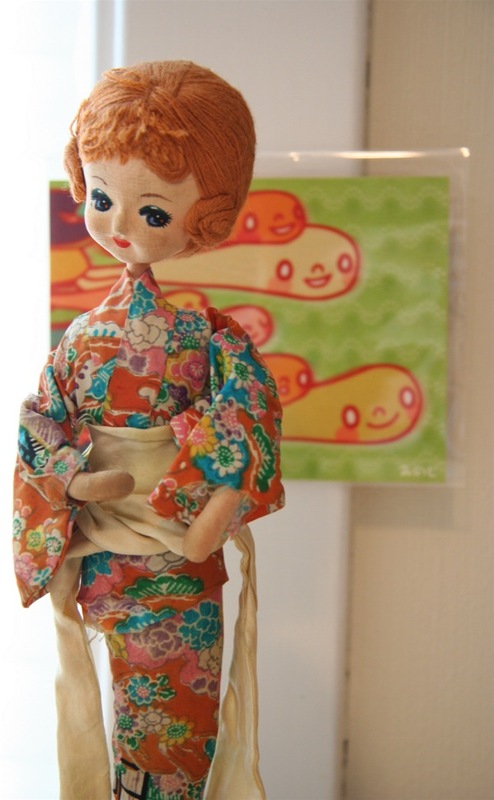 those mod japanese dolls remind me of dolls i had when i was little. 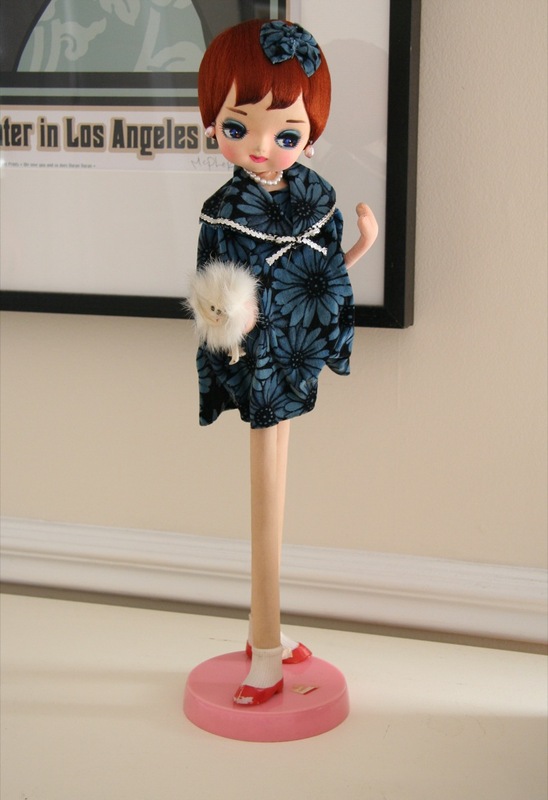 made the same way with long limbs and big heads, but the colthes were more along the scarlette o’hara variety. anyone else have’em? i’m talking circa 1978-80. I love the Mod dolls!! Looks like you had a stellar day! Such wonderful finds! Great job! Holy Estate Sale ELATION!!! Oh the GNOMES!!!! If you ever want to swap for one give me a holler!! Unbelievable. Un be LIEV able. These are, seriously, the first dolls I’ve ever seen in my life that I’ve liked. How. Psyched. Are. You! Very! Those dolls are absolute TREASURES. Look at the shoes! The SHOES, people!!!!! 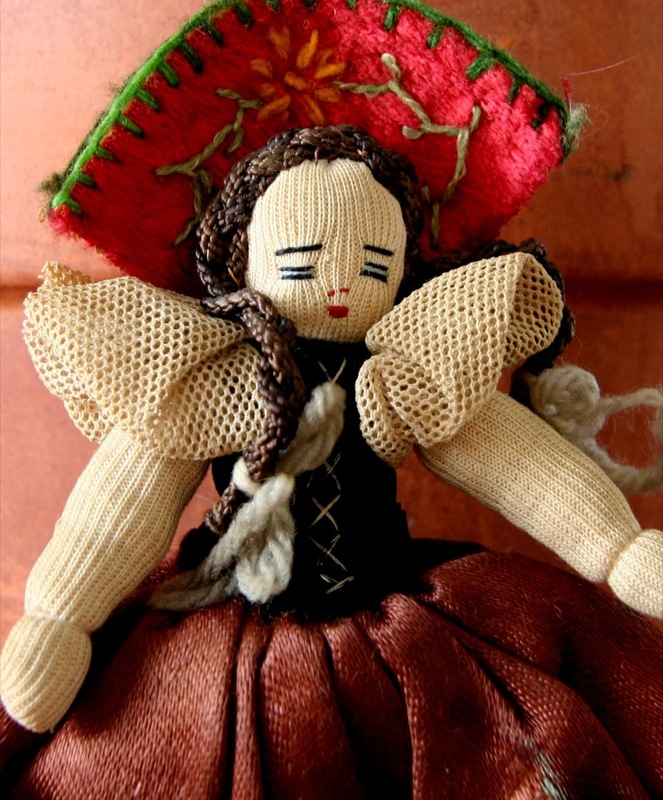 Oh My…I WOULD have fainted at this crazy sale of doll madness! Wow! 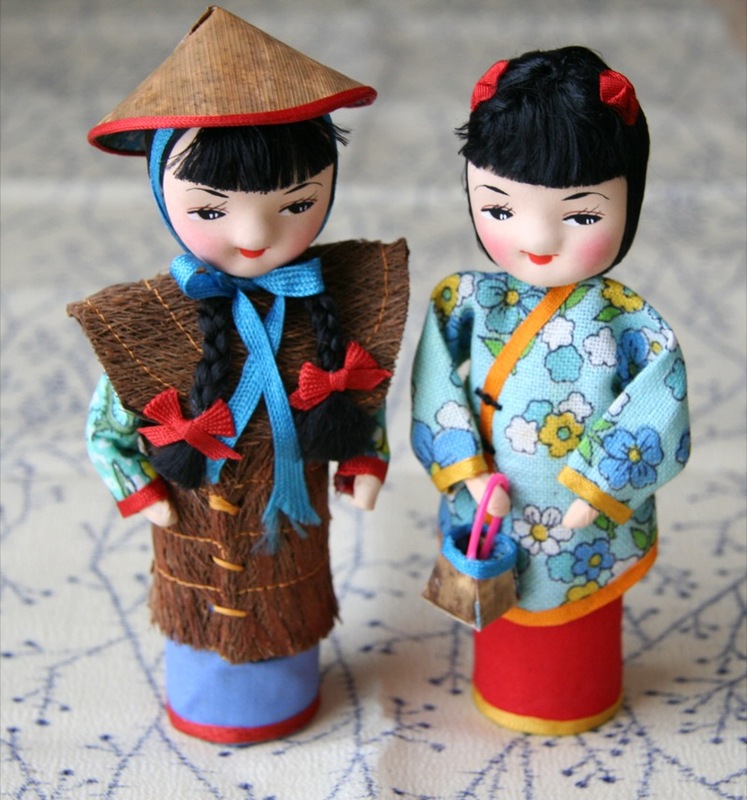 The Japanese Dream Dolls are incredible. What a score! This sort of find is what makes estate saleing so exciting. wow wow wow. amazing finds. huge score!!! thanks for sharing all your great finds with us. I love collections, and some of your dolls are very speciall! i am a thrift store junkie too!! we should go shopping together since we both live in chicago. let me know if you want it-and i’ll send it before i head out of town this weekend. 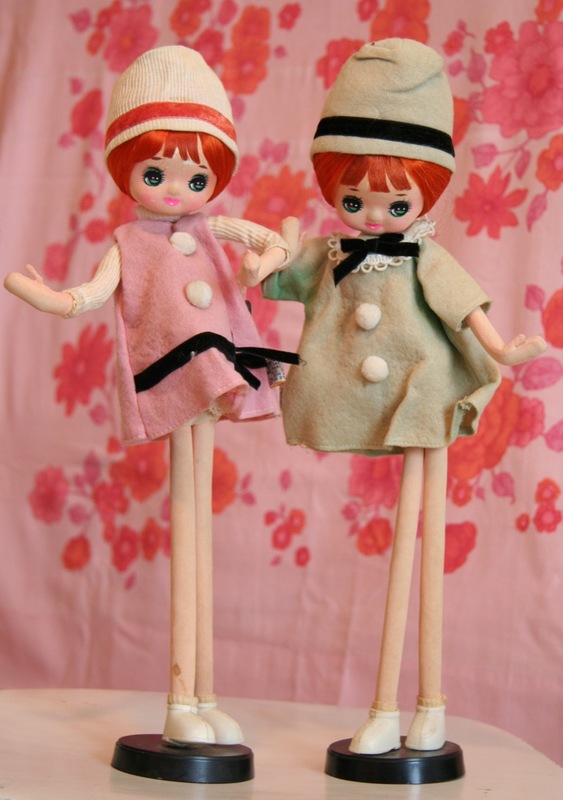 Would you be interested in purchasing a small collection of Joli Jolidolls in good to excellent condition?